For over four weeks, we’ve watched the rally in the SP500 trace out a corrective wave up from the low of 2553.60. We began with what was a textbook contracting triangle. Then two weeks ago, the Nasdaq indices suddenly rallied into an ending diagonal. On Monday of this week, the SP500 (and ES) followed suit and also began to rally into an extremely weak ending diagonal. The third wave that we’re in has about another 15 points to go to a new high to technically complete the third wave of that ending diagonal. But that’s not all that’s going on with ending diagonals: These are the players that are all working on ending diagonals — SP500, ES NDX, NQ, Nasdaq Comp, Russell 2000, and Russell 3000. Ending diagonals are ending waves. I consider them corrective (although, in Prechter’s book, they’re contained within the section on “motive waves.” In a fifth wave position, which we’ve “morphed into” this week, they foreshadow an imminent trend change. That’s a hard rule that will NOT be broken. An ending diagonal is different than an contracting triangle in that it has a slight upward tilt to it (a diagonal pattern) in a bull market. The other difference is that the waves get shorter and shorter as we move through the pattern. The fifth wave up has to be shorter than the third wave up. That put “a cap” on the market. 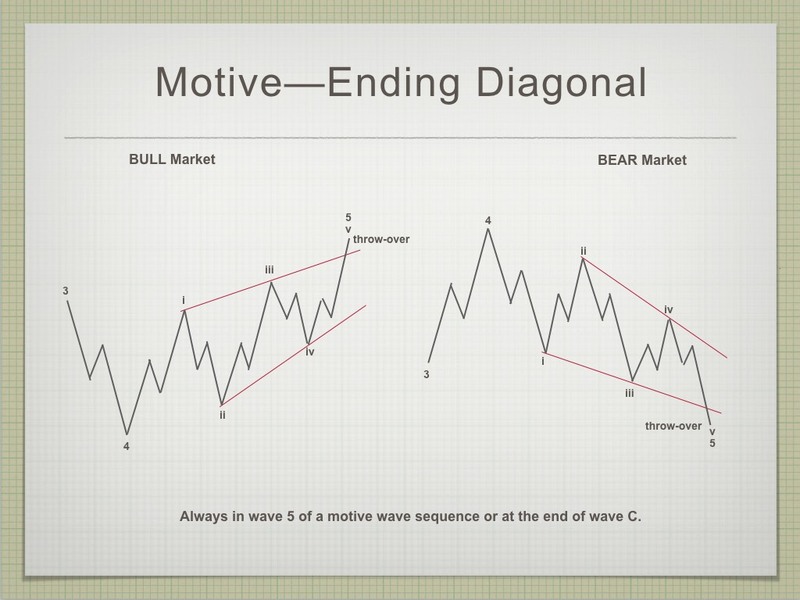 An ending diagonal is a fifth wave pattern, as opposed to a contracting triangle, which is a fourth wave pattern. This difference doesn’t make much difference going forward. I any event, we have one more wave down and another one to the upside it the US indices before the trend changes. In each case, the final fifth wave cannot be longer than the third wave, so this puts a limit on the distance this market can march higher. It looks like it won’t get much above a new all time high. The inherent weakness is abundantly obvious. Volume is almost non-existant. Sentiment continues at historically bullish levels. On Thursday, the European Central Bank announced that is has virtually given up and it’s stopping its quantitative easing, which will be deflationary. The US dollar has one more wave down to a new low to complete the large corrective fourth wave that its currently in. Then is will turn back up for good. That’s also highly deflationary. The Federal Reserve is trying to reduce its balance sheet — also deflationary. As I’ve been saying for the past couple of years, everything will top at the same time, but to do so, they all have to finish their final waves within Elliott wave rules. After they all top, they will all move down together in what’s going to be the show of a lifetime. The drop in the eventual third wave (likely this fall) will be labelled “the crash” and it’s likely to be breathtaking in it severity. There’s a really ugly full moon coming in October 24, which coincides with my musing on when we might see the crash. I’m focussed on that time frame for a potential crash. Above is the 2 hour chart of the NYSE (New York Stock Exchange). This chart is a good indication of the inherent weakness in the market. Many of the indices have transitioned into an ending diagonal (a fifth wave patter). However, the NYSE, which these other indices are a subset of, is still going sideways in a contracting triangle. This contracting triangle will finish off the blue E wave down, while the ending diagonals complete their fourth waves down. They will all turn at the same time into the final fifth wave up to a new high. Last weekend, I complained about the sideways movement in ES (for three solid weeks). Two weeks ago we got a very fast resolution for the Nasdaq, as it morphed into an ending diagonal, by rising to a new high, tracing out wave 3 of that diagonal. On Monday of this week, the NYSE subindexes (SP500, Russell 2000, Russell 3000, and ES (emini futures)) followed suit. 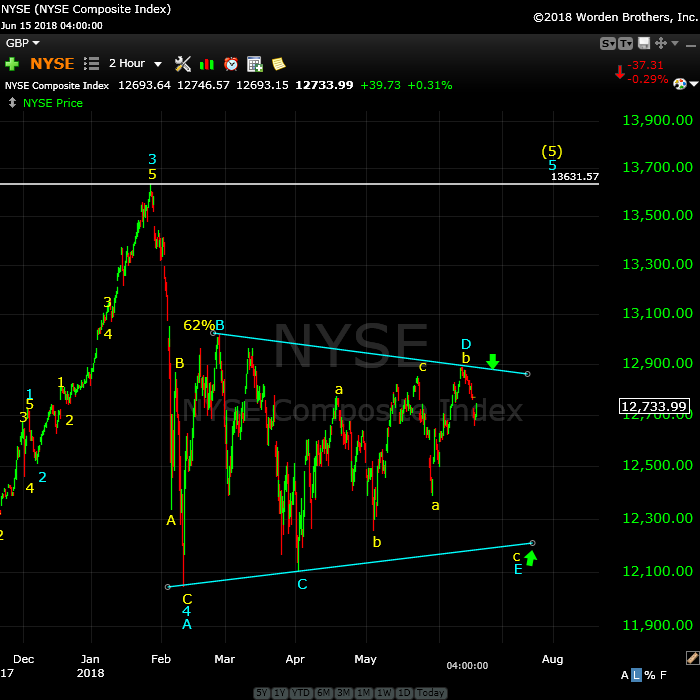 We now have ending diagonals all over the place, except in the NYSE itself, the DOW, and OEX. The NYSE continues its contracting triangle. The DOW and OEX appear to be in fifth waves of some kind (the pattern is open to interpretation at the moment). In the chart above, you can see that this ending diagonal move is subtle. It still looks much like a contracting triangle. However, the move to a new high in the third wave confirms an ED, although incredibly weak. Note the low volume, with an ellipse over the current level in the purple indicator below the chart. The NYSE indices are all extremely weak - that's what this configuration tells me. Summary: We continue to trace out the third wave of an ending diagonal. We're very close to a third wave top (possibly Monday). Topping out will result in a high probability trade to the downside (the fourth wave of the ending diagonal). Once the 4th wave (down) is complete, expect a final fifth wave to a new high. That fifth wave up to a new high will be the end of the 500 year bull market. I believe wave three needs to exceed wave one for an ES ED to be confirmed. Based on the new moon high on June 13th that you mentioned…in your “experience” the new moon low you sited due July 13th…Will that potential low be much of a sell off or just a sideways choppy affair. Borrowing Peter’s words from this update I am in total agreement with . we have one more wave down and another one to the upside it the US indices before the trend changes. In each case, the final fifth wave cannot be longer than the third wave, so this puts a limit on the distance this market can march higher. It looks like it won’t get much above a new all time high. The inherent weakness is abundantly obvious. Volume is almost non-existant. Sentiment continues at historically bullish levels. My own thought is what happens if someone jams the signal ? 4 weeks of sideways action . My bias has been and continues to be bearish for this year . Right now I’ll include my thoughts above . I’ll be able to look much closer at the market this coming weekend . Best guess on ES 2767-2730 with a potential reaction back to 2807. Not my work though so take it with a grain of salt . Thanks Joe. I was a bit concerned about the ES ED as the third wave failed to move higher than wave one ahead of that Friday gap down. A second opening gap down today is looking more and more like the last wave up completed. The ED also looks a bit unusual as the first wave also failed to exceed the high of the previous wave of similar degree, putting much of the potential ED inside its price range. As Peter has observed, market weakness seems to be resulting in malformation of these final waves. Another impulsive decline in ES. The waterfall candles were quickly arrested and they are throwing billions at futures to avoid breaking the cash session futures low at 2761.25. Tomorrow could be ugly. Any ideas as to what went wrong with your call for a June 20/21 high? This is not meant as a criticism. Just trying to understand how you arrive at your astro interptetation. No one gets it right 100% of the time. June 20-21 is a turning point so we could see a lower top here (bounce). I went short on the AEX today. I’ll assume everyone using options was positioned for a bullish week into expiry . July 2 and July 13 are the next swing dates yet July 2 could end up as the low. A further bearish bias going forward . My comments prior still stand though. Pattern generally plays out is all. Not a trade I’m interested in taking . I have no idea what this freakish market is doing. Looks like some kind of rising wedge B wave just completed. I am taking the money an running on DIA 250 puts and 248 short calls. Still holding long DIA 250 calls in anticipation of furious relief rally. Thanks Mike. /ES has formed a big albeit red for now daily hammer. So today may be a swing low to your equinox. Sold spy long calls. Just an intra-day trade. Don’t want to hold overnight just in case tomorrow is just a chop-chop day. Yep. That’s exactky what I expect. Hi Peter thanks for explaining the markets. In the Chart Show today, I’m going to show you the most probable path for ES/SPX over the next couple of weeks. The same for USDJPY. Peter thanks for the examples to learn E W. After a few hours I made the conclusion not to do it. I think You and the members can give me the Theory and results of E W and I give You and the rest the results of my 5 (til 9) indicators. The time I spend is about 20 hours a week and I also work 40 hours. So there is no more room for extra. In about 3-4 Years the “Old One” is having his pension. It takes a long time to learn EW properly and it’s expensive to test it … lol. The equinox high for those bullish into the 21st is done. Would like to see indices waterfall into the close instead of this daily gap downs & recover mid-day. PPT should give bears a bone. Give them a Black Friday or Black Monday. Commercials have covered half their short positions in E mini futures on the recent decline. Indicators calling for a huge decline on Monday are probably going to loose money for traders following that script. Do folk using forecasting methods pay any attention to the COT reports? Just curious.